The OzFACE facility is now fully operational at our tropical savanna site at Yabulu, about 20km north of Townsville. Construction commenced in December 2000 and was completed in April 2001. Campbell Scientific Australia, with some assistance from Campbell Scientific in the US, designed and constructed the system. The FACE system consists of six rings, each 15 m in diameter. 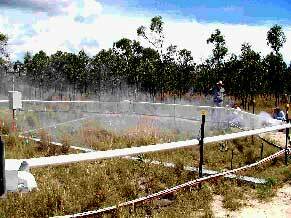 The vegetation enclosed by two rings is exposed to ambient CO2 (370ppm), two rings are exposed to a CO2 level of 450 ppm and the remaining two rings are exposed to CO2 concentrations of 550 ppm. Within these plot areas, one third of the area is left intact, one third is clipped to simulate grazing and one third has nutrients added to simulate higher fertility savanna locations. Local eucalypt and acacia seedlings have been planted to study woody-grass dynamics, which is a critical issue in savannas, in terms of current land management practices and the impacts of future climate. It was not possible to include mature eucalypts or acacias within the FACE rings. Measurements include net primary productivity and species abundances, plant basal area, forage quality, a range of plant physiological measures, plant defence compounds, plant phenology, litter decomposition, soil respiration, soil moisture (NMM and TDR monthly), soil fauna, soil organic carbon. Through collaboration we hope to look at root turnover using mini-rhizotrons. The FACE design is an octagonal system with small blowers attached to each of the eight 100mm PVC pipes in each ring. We have a two stage CO2 control process. For each ring we have four solenoids of different capacities controlling overall release of CO2 to the ring and finer level control is provided for each segment with 2 solenoids (the segment most perpendicular to the wind releases at proportionately 1.0 and the two side segments at 0.7). CO2 is injected into the plenums immediately in front of the blowers. We have the IRGAs in the middle of each ring to reduce delay time in CO2 sampling. We have been testing the system for the last month or so and at this stage we are within 10% of the setpoint 80% of the time (one minute averages) during the day. However, at night we are within 10% of the setpoint only about 65% of the time because of almost zero wind. We expect further improvements as we fine tune the PID algorithm. Currently our CO2 use is about 1.5 tonnes from 6am to 6pm and about 0.7 tonnes between 6pm and 6am. Wind gusts in the afternoon can reach 15 m/s and often average 6 m/s. We have constructed a portable spatial sampling system and spatial control looks pretty good so far though we can only test one ring at a time.